The Paper Bakery Kit Club and a giveaway! It is my pleasure to bring you this review of a kit club called The Paper Bakery! 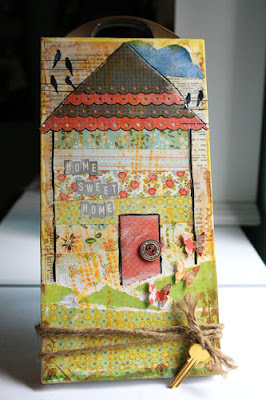 This is a kit club started by Sarah Hill a former scrapbook store owner turned kit club owner. This club offers kits for scrappers and crafters alike who love the fun of mixed media but want the ease of putting them together. This kit has it all! Fun projects, add on kits, full color instructions, a blog and design team to inspire, and great up-to-date supplies! Costs varies depending on what length of committment you want. They offer 3,6,12 month subscriptions as well as one time purchases. Kits are shipped on the 10th of each month and reveals are on the 15th. Ease of use: I got the most recent project which is a multimedia canvas home decor project. Full colored instructions were included and extremely helpful. Great for those who may not have worked with multimedia products like stencils. Instructions were step-by-step but encouraged you to make your project your own. I loved that the embellishments were in their own little bag and the whole kit came in a large plastic bag to keep it all together! Construction/Durability: Great packaging of the kit as a whole and all the elements within the kit. Usefulness: I loved that this kit had several different mediums to play with. Paint, stencil, rub ons, stamping, paper, buttons. Cost effectiveness: I found this kit to be quite comparable to other kits out there. I loved that it's a mix media kit that allows you to play with things you might normally not even thing to put together. For all the product you received I felt this kit was right on! What I liked: The project itself is dang cute!! I loved the packaging and I really loved all the products that came with the kit. 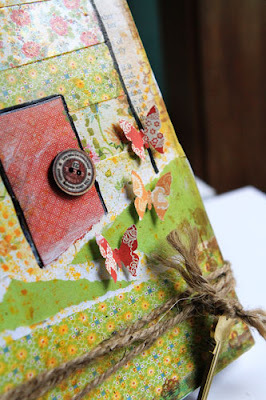 Beautiful papers, embellishment, etc. What I made: I was given their latest project "Home Grown"
Such an adorable project! I loved getting messing with the mist and paint and really just loved playing with all the elements. I added a handle to the top of my canvas and a key with some twine to the bottom of the canvas! So cute! What do you think? Do you belong to a kit club? What do you look for in a kit club? Let us know we want to know what you think! Let us know by midnight PST on Tuesday and we will pick a winner to receive a prize pack from The Paper Bakery!! I love me some mixed media kits and the October Afternoon items I see are some of my favourites! I used to belong to a couple of kit clubs, sadly they both went out of business. Now I buy them here and there when I see something that catches my eye. I do prefer kits to just purchasing one collection. I love when they are coordinated and the papers go together but not necessarily all the same manufacturer. I also love getting a few embellies to the whole pack and love some nice alphas and cardstock to go along with it all. I am on the Scrapbook Circle DT and I LOVE their kits! This one looks great! Your project is really fabulous. I do love kits but sometimes I hesitate getting them when they start creeping up to the $50 mark since I have a SAHM budget :)so I only buy them here and there.. Love what you created and will have to check them out. I have never tried a kit, simply because I am afraid what may appeal as a good combination to the kit designer may not look good to me. (You know, if lace and chevrons are all the rage and she included them, I don't really like or use them)... Also I find the price off-putting. I shop sales and eBay and I find that I can buy a great deal more that way. But - it would be nice to find a kit club to rely on! I have never bought a kit before. I've looked at them and just wondered if I would make the project the way its suppose to be made or would I just use the supplies somewhere else and made my version of the project. I wish I could afford to belong to a kit club!! Love this one!! TFS your lovely work and for a chance to win! I love kits so much - this one is new to me. Thanks for the intro and the giveaway! looks like a super cute kit. I do not subscribe to a monthly kit club but will occasionally buy a kit. I've never belonged to a kit club & really don't have the time or $ to join one. This one sounds like it would be good for me. I'm really interested in mixed media but hesitate to invest the $. I learned of another one over the weekend that sounds good. Maybe you could check it out. It's called Scrapbooking from the Inside Out. sigh.....how gorgeous is this kit! 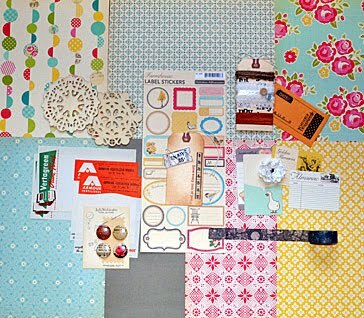 I am currently a Studio Calico Kit subscriber, and for me, scrapping with a kit is the way to go!!! Love the kit! I'm a huge fan of kit clubs...I love how they already coordinate and look great together! I look for a nice variety! I don't belong to any clubs because it seems like the prices are higher than what I could pay buying pieces separately. The products do look nice, I just need to check out how much I think they are worth. The project you made looks nice--I like the handle and key. The paper looks thick, and of good quality. I'll check it out. The papers look nice. I'm just learning about mixed media, so this kit would probably be a good idea for me. I took a CHA class, and was intrigued. Thanks for alerting us to this. It looks like a nice project. 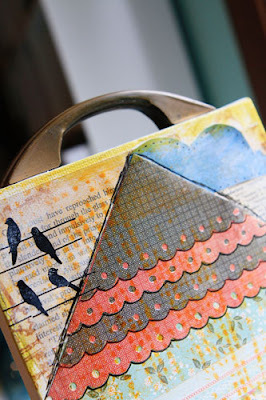 I wonder how many other things a person could make with the left over items.....A mixed medias basics book, or maybe a monthly tutorial would be nice if it comes with it. Maybe I just need to find a good book. But I'd like to try a kit because I might be lost otherwise. I don't belong to a kit club but I love the mix of products in this kit by The Paper Bakery- their blog had fun project examples too! I've never bought a kit. I'm afraid it will have products I will never use. And, I think the kits cost a lot. I can buy a lot of other things for this price. Perhaps it is a good price for what you get, but I should like to see before I buy. So, only a single kit is a possibility for me. I have bought one kit from Sarah and I love it! I am planning to join soon, hopefully. Thanks for the chance to win something beautiful:). I got a year's subscription to Studio Calico and I love it so far. One thing I really like about kits is everything coordinates nicely and takes the guessing out of me getting my supplies together and allows for more time scrapping instead of searching! I have a subscription to SEI's layout club. This looks interesting although I have never done anything in mixed media before. I look for kits that I feel are a great value for product that I will use as well as provided new techniques to try each time they send a kit. I have never belonged to any kit before simply because I don't know what it will contain. I might not like the contents. I would love to find a kit that would let me use new products or new trends and at the same time learn new techniques such as the above. I belonged to a kit club through my LSS. Loved all the products but wish it came with idea/instructions for LO's and projects. What a fun looking kit and gorgeous project! I love this kit club! They are so awesome and have such a nice variety to their kits!! I love the idea of different media! Thanks for reviewing this kit club, I'm definitely checking the Paper Bakery out! I have bought lots of kits, but never can commit to a club because I think they would start to pile up when life gets in the way. Love the contents in this one! Ooo...this totally looks like a fun kit! I haven't done too many kits before, but this one really looks great! What a great kit! I don't belong to any kit clubs currently but I used to be on a kit DT and it was amazing! I'm definitely keeping my eye on this kit club.I really like that it is project oriented and comes with detailed instructionsJust what I need.